SHENZHEN, CHINA - OCTOBER 8: Joel Embiid #21 of the Philadelphia 76ers dunks against the Dallas Mavericks as part of the 2018 NBA China Games on October 8, 2018 at the Shenzhen Universiade Center in Shenzhen, China. The 76ers might not have won their final game of the preseason, but they sure wrapped things up behind another encouraging performance from one of their budding stars. Joel Embiid had his way with the Dallas Mavericks, going for a game-best 29 points in Monday’s 115-112 loss at a sold-out Shenzhen Universiade Sports Centre. The All-Star was especially dominant when he decided to attack the interior, his might manifested in the form of several overpowering dunks he unleashed throughout the night. That Embiid ended the preseason with his highest scoring showing felt like a fitting way for the 7-footer to head into the regular season. He converted 11 of his 22 field attempts, and missed only five shots from inside the arc. For the preseason, Embiid increased his point total each game, reaching the 20-point mark in all four outings. He finished with averages of 23.0 points (on an efficient 53.8% shooting, by the way) and 8.5 rebounds, statistics that, when combined with the 7-footer’s mindset, represented promising precursors to a highly anticipated campaign. 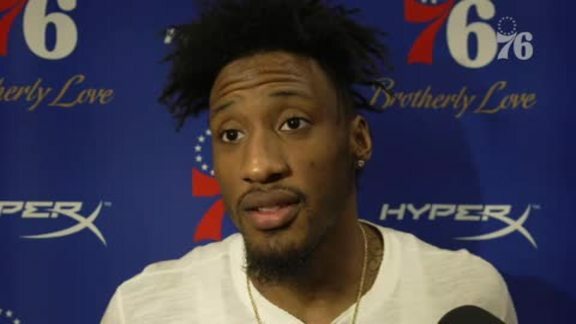 Robert Covington also notched a personal pre-season high Monday in Shenzhen. He posted 18 points (7-18 fg), while wreaking havoc defensively with six steals. Ben Simmons was the third Sixer to punctuate the preseason with his most prolific scoring game to-date. In addition to 10 points (4-8 fg), he registered nine rebounds, and six assists. Throughout Monday’s competitive match-up - the finale of the 2018 NBA China Games series - momentum swung back and forth. 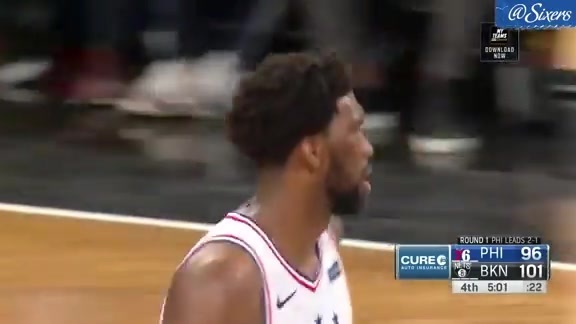 The Sixers trailed by as many as eight points midway through the first quarter, but then roared ahead by nine in the second. With reserves from both sides having taken over in the fourth frame, former Villanova standout Jalen Brunson (11 pts) led Dallas on a late charge to seal the game. Click here for a full box score. It was an experience not every team gets to enjoy, and clearly one the Sixers appreciated. While the NBA China Games 2018 came and went quickly, the players seemed to soak up everything the trip had to offer. Are you ready for some basketball that counts, for real? And how about an opening date at the same site your promising playoff run from the previous year came to an end? So it will be next Tuesday, October 16th, when the Sixers begin their 70th season by returning to TD Garden in Boston. The Celtics, of course, eliminated the Sixers this past May in a five-game Eastern Conference Semifinals series. The C’s, however, are poised to start the 2018-2019 campaign with a bolstered that features healthy All-Stars Gordon Hayward, and Kyrie Irving.